Want to deposit a check into your bank account without having to visit the bank? That’s right – you can now simply take a picture of the front and back of your endorsed check and deposit it directly into your account. Oh yeah, you have to be a Chase customer using the Chase banking iPhone app. But this is a pretty cool feature that I’m sure a lot of Chase customers are going to utilize and find VERY convenient. Which means that other banks like Bank of America and Wachovia will probably follow suit shortly with their iPhone apps. 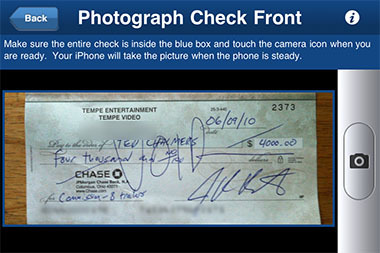 The app is called Quick Deposit and simply requires a picture of the front and back of an endorsed check that you snap with your iPhone built in camera, and then you can submit that image via your iPhone app. The amount is deposited directly into your account. Chase then encourages you to destroy the physical check as soon as it clears. You can use Quick Deposit with an iPhone 3G or higher, and the service is free for Chase customers enrolled in online banking. Customers can make unlimited number of deposits from their iPhone with a daily deposit amount of $1000, not to exceed $3000 monthly per customer account. “We know that people who use the iPhone want to use them for as many tasks as possible,” said spokesman Tom Kelly. Since the feature became available in mid-July “thousands and thousands” of existing Chase customers have downloaded the app, motivated in large part by the added deposit function, he said.